Choose the String of lights that suits Your environment, whether its warm white for Ambience and Warmth or Bright White Sparkling Lights we have the Length, Colour and Styles to suit Your Need. Evening meals Draped in Moon like Light. You can use Strings to Add Sparkle to practically Any area. Our Range of Battery Powered Lights are Designed to Last Long Periods Of Time to Save You Time Changing the Batteries. PowerBee's Range Utilises Easy to Change Batteries, Auto Modes, Timers, Low Voltages, On / Off Options and Eco Modes, Making Your Fairy Lights Last Longer. Our Led Lights will totally Transform your Home & Garden, Lift Your mood and Awaken Life in to Your Home, they give a Warmth and Sparkle of Excitement Draped or Strung Outside. 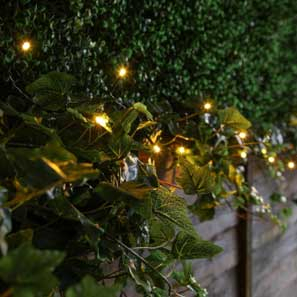 Fairy String Lights are the latest Trend for both in and outside the house, adding a touch of magic anywhere, most of our lights are also weather proof, so you can use them anywhere you want. They are really so simple to use, simply insert the required batteries and turn them on ! We strongly recommend buying a battery charger these are really cheap now a days, and if you buy a few rechargeable batteries then you can charge a set, whilst using a set. This will save you a lot of time and money. We only use the best quality materials, our manufacturer is ISO certified that's because we really care about what we do!